Enigmatic cosmic rays that strike Earth with giant amounts of energy might come from hot gaseous "superbubbles" in space, a new study reveals. Cosmic rays have perplexed scientists for a century. These electrically charged particles bombard Earth with energies dwarfing anything we are capable of, but their origins remain a mystery. 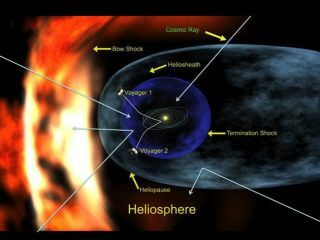 Since cosmic rays are electrically charged, they can get pushed and pulled around by interstellar magnetic fields in the gas between the stars as they zip through space, obscuring where they come from. One suspected fountain of cosmic rays are star-forming regions. The massive stars within these stellar nurseries can spew out massive amounts of energy and explode as supernovas. Now scientists may have pinpointed cosmic rays coming from a superbubble, one caused by powerful winds from clusters of young, massive stars punching into the surrounding molecular clouds of gas and dust. The superbubble in question lies in the Cygnus X region of the sky, within the constellation Cygnus, the Swan. It was likely created by clusters of massive stars, such as the Cygnus OB2 association, a very large cluster about 4,500 light-years away. The cluster contains more than 500 stars, each more than 10 times the mass of our sun. NASA's Fermi Large Area Telescope detected a wide range of gamma rays — the most energetic form of light — emanating from a space about 160 light-years wide. The spectrum of gamma rays seen match those one would expect freshly generated cosmic rays to give off. "For the first time, we have caught a glimpse of the early life of cosmic rays in these regions of massive star formation," study co-author Luigi Tibaldo, an experimental physicist at Padova University and Italy's National Institute of Nuclear Physics, told SPACE.com. The gamma rays the researchers detected appear confined within this superbubble, which might suggest the cosmic rays creating them "seem trapped, as if they have a hard time getting out," study co-author Isabelle Grenier, an astronomer and astrophysicist at Paris Diderot University in France, told SPACE.com. "This might really change the way we think cosmic rays propagate, and if they're giving off energy as they're trapped inside star-forming regions, they may be changing the chemistry within, affecting how stars form," Grenier said. The scientists detailed their findings in the Nov. 25 issue of the journal Science.